It has been said that Yoshisada Nitta enshrined enclosed the Kobomie writing brush in a glass pagoda and enshrined it to establish this shrine during a punitive expedition of Takatoki Hojo. 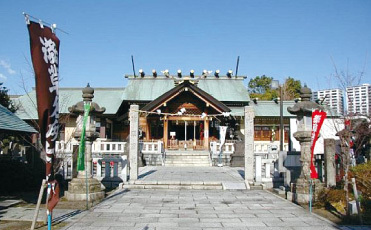 The present shrine is a building built during otabisha reconstruction in 1982 and it is enshrined as a subordinate shrine, but until the otabisha was relocated from Umegaecho (present Nishitenman rokuchome) to the current location in the Meiji era, it was venerated by many as a guardian deity of birth place for women working in Chayamachi. Yoritomo Minamoto prayed for Oushu conquest and raised the shrine to express appreciation for the achievement in 1189. Ishihama torii is in its distinctive form and the precinct is known as a location thought to be flowing with mystical energy, which has 8 shrines and Inari shrines including a place to worship Mount Fuji from a distance. Recently, the place has become popular after the discovery of the information on Ishihama castle. The precinct also has Sumidagawa Poem Monument of Bousai Kameda and a monument of miyakodori of “Isemonogatari”. It is one of seven sites of Asakusa Seven Gods of Good Fortune (Jurojin). Gennai Hiraga is known as the person who restored and produced Erekiteru (friction electric generator), invented a fireproof cloth (asbestos fireproof cloth) and popularized “Doyo No Ushi No Hi” (Midsummer Day of the Ox) by using the first advertising catch phrase in Japan. In 1779, he was mistakenly involved in a murder case and died of illness in jail, then buried at Sosenji Temple in Hashiba. 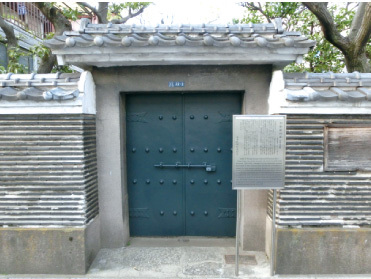 The temple was transferred to Azukizawa, Itabashi ward in 1928, but the grave was preserved in this location. In 1931, Tsuijibei riverbank was repaired. It is a nationally designated historical site. It is a holiday house of Sanetomi Sanjo, a statesman who contributed to the Meiji Restoration. A Memorial is built at south west of a foot of Shirahigebashi Bridge to commemorate the Emperor Meiji’s visit to Sanetomi who were treating illness here. The building of Taiosou has been dismantled and it was reconstructed in Former Tama Seiseki-Kinenkan (Memorial for Royal Visit of Meiji Emperor) (Rengoji, Tama city). It has been said that the name “Obake Jizo” is created because in the old days, a bamboo hat that the Jizo had on the head changed a position by itself or because of its extraordinary size that is over 3 meters high. It was created in 1721and was broken in half during Great Kanto Earthquake, but it has been repaired and keeps the shape in the present day. All night light was built in 1790. A legendary place of Myokini and her son Umewakamaru that is famous for the Noh song “Sumidagawa”. In Heian era, Umewaka, the son of Yoshida no Shoushou Korefusa was kidnapped, abandoned in this place on the way to Oushu and eventually died because of a severe illness. The mother who came looking for her son was informed of her son’s death by the river bank of Sumidagawa River and then shaved her head to live in a hermitage while calling herself Myokini. A memorial tower stands on a small hill. Also, there is Umewakazuka placed in Mokuboji Temple (Sumida ward) that is located on the other side of Sumidagawa River. Both are designated as the places of historic interest of Tokyo prefecture. 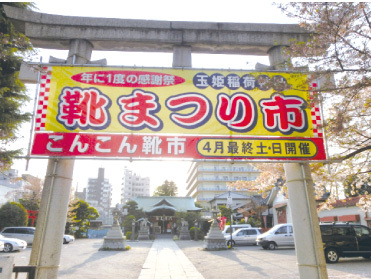 It was established in the present Yashio city, Saitama prefecture and was transferred to the present location. A small candle used in a family Buddhist altar is called “Kouganji candle” because it has been said that the chief priest of the temple had Echigoyauemon candle shop in Kyobashi to make small candles in Enpo period (1673 to 1681). The line of people visiting Gake Jizoson never ended and the small candle was invented in order to correspond to the demand of people who could not wait until the candle of the person visiting before them are burnt completely. They were established in 1624 and were originally placed at the entrance of former Oushukaido Road, but were transferred to the present location in 1928. There are “Seated figure of Dozo Jizo Bosatsu”, which is one of “Six Jizos of Edo” that are designated tangible cultural properties of Tokyo prefecture and on the left sits a married couple statue of a founder of Ginza Kimuraya Sohonten who invented anpan bread, Yasubei Kimura and his wife Buna. A grave of Takao, the second generation courtesan of Yoshiwara sits in the cemetery in the precinct. “Takao” is a professional name assumed by the representative talented geishas. Tsunamune Date, the lord of Sendai Domain fell in love with this second generation courtesan and an anecdote was created that he bought the freedom of this courtesan by paying the gold as heavy as the weight of Takao, which created a moniker “Sendai Takao”. Her posthumous poem “Maple leaf fragilely fall off the branch in the cold wind” is engraved on her gravestone. Copyright © 2016 ASAHI SHOUTENGAI .All right reserved.